Part I - Introductory Topics. 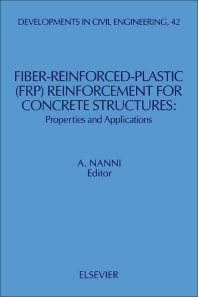 FRP reinforcement for prestressed and non-prestressed concrete structures (A. Nanni). FRP reinforcement: materials and manufacturing (C.E. Bakis). Properties of FRP reinforcements for concrete (L.C. Bank). Part II - International Perspective. A Canadian perspective on R&D, design/codes and technical committees (M.A. Erki, S.H. Rizkalla). FRP developments and applications in Europe (L.R. Taerwe). An overview of R&D in Japan (Y. Sonobe). FRP development in the United States (C. Dolan). Part III - FRP Reinforcement Products. Part III.a: 1-D Reinforcing Systems. Glass FRP reinforcing bars for concrete (S.S. Faza, H.V.S. GangaRao). Properties and applications of vinylon FRP rod (CLATEC Rod) (M. Okazaki). CFCC (Carbon FRP Cable) (N. Santoh). Testing and application of prestressed concrete beams with CFRP tendons (T. Katou, N. Hayashida). TECHNORA, an aramid FRP rod (K. Noritake, R. Kakihara, S. Kumagai, J. Mizutani). FiBRA (T. Tamura). Glass fiber prestressing system (R. Wolff, H.J. Miesseler). PARAFIL ropes for prestressing applications (C.J. Burgoyne). Part III.b: 2-D and 3-D Reinforcing Systems. NEFMAC - Grid type reinforcement (M. Sugita). Three-dimensional fabric reinforcement (H. Nakagawa, M. Kobayashi, T. Suenaga, T. Ouchi, S. Watanabe, K. Satoyama). New three-dimensional FRP reinforcement (T. Yonezawa, S. Ohno, K. Inoue, T. Fukada, R. Okamoto). Part III.c: External Reinforcing Systems. FRP bonded sheets (U. Meier, M. Deuring, H. Meier, G. Schwegler). A retrofitting method for reinforced concrete structures using carbon fiber (Y. Kobatake, K. Kimura, H. Katsumata). The use of fiber reinforced plastic (FRP) composites for prestressed and non-prestressed concrete reinforcement has developed into a technology with serious and substantial claims for the advancement of construction materials and methods. Research and development is now occurring worldwide. The 20 papers in this volume make a further contribution in advancing knowledge and acceptance of FRP composites for concrete reinforcement. The articles are divided into three parts. Part I introduces FRP reinforcement for concrete structures and describes general material properties and manufacturing methods. Part II covers a three-continent perspective of current R&D, design and code implementations, and technical organizations' activities. Part III presents an in-depth description of commercially-available products, construction methods, and applications. The work is intended for engineers, researchers, and developers with the objective of presenting them with a world-wide cross-section of initiatives, representative products and significant applications.